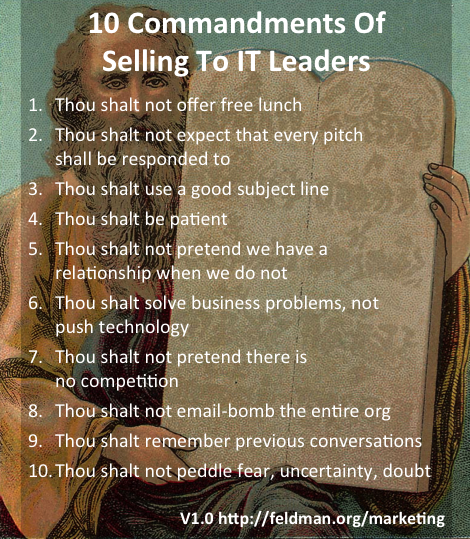 The IT-hates-sales dysfunction drives me nuts. Of course IT needs to talk to sales folks. We can’t deliver great IT unless we use great products and services. Yet, so often, sales folks so very often shoot themselves in the foot by not following basic rules of engagement. 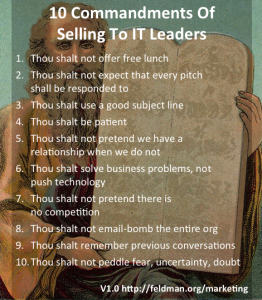 So, without further premable, allow me to share 10 commandments for selling to IT folks, based on my career both inside IT as well as a stint on the vendor side. Absent an actual business relationship, what do you get when you offer a free lunch, golf tournament, or other freebie? You get a freeloader. You don’t get someone who is actually interested in doing business. Those people are too busy to spend time with you at a free lunch. The buyers you want to connect with, the ones who have authority over spending? They really don’t care about freebies. And freebies even annoy them, sometimes. IT is under siege. According to Sanebox, I got almost 1,000 emails last week, many of which were pitches. I didn’t get 1,000 cold calls, but I got quite a few. It is totally impossible for me to respond to each one. Most IT leaders are in this situation. We didn’t create it. If you’re looking to establish a relationship, don’t whine about it. IT leaders want to get something useful from you. Two things to watch out for: first, don’t use an irrelevant subject line like, “March Newsletter From YourCorp!” We don’t care. A subject line like, “Reduce broadband costs by 30%” has a better chance of getting read. Second, don’t lie. “Our meeting tomorrow” is almost guaranteed to be read, but when it’s not true because you’ve PROPOSED a meeting that I haven’t accepted, it’s guaranteed to get you sloughed off to the slush pile if we don’t really have a meeting tomorrow. IT leaders get a lot of pitches. It’s cool to follow up, but be patient. You’re trying to establish a friendly relationship, right? Displaying an understanding of our problems — like not enough hours in the day — is a good way to start. IT leaders are looking to solve business problems via technology. They don’t adopt cool technology because it’s cool. If you’re looking to push cool tech, push it with engineers, not IT leaders. Any IT leader is savvy enough to understand that there generally IS competition for your product or service. Don’t pretend that there isn’t, unless you really are a startup that has invented a whole new category. In my experience, this is only about .1% of pitches, so be very sure before you pitch. If you’ve really invented a new category, it’s not all sunshine and rainbows. It means that there’s no real marketplace for your product yet; that’s not good, because a savvy business leader understands that when there’s no marketplace, there’s a lot of risk to your continued operation. So, admitting to competition is a good thing. It is not good for your relationship with the IT leader if you bypass her. She’s responsible for IT for the organization; why would you disrespect that if you hope to build a relationship that eventually leads to a sale? It’s also not good for your relationship if you pitch the IT leader and then follow it up by email-bombing the entire organization. That creates significant email traffic, because nobody actually wants to talk to you; they want to forward it on to the IT leader. Congratulations, you have generated rage. What will you do with all of this newfound rage? Probably not sell a product. IT leaders respond to some pitches, when they make sense, offer clear business value, and line up with the organization’s priorities. But when they do, woe unto you if you don’t remember those previous conversations. It means you’re wasting the IT leader’s time, not a great idea. In this day and age, you would think that sales folks would understand that peddling FUD is a bad idea, that it saps credibility, but, no. I still see a lot of fear-mongering. The type of leader that you want to sell to, the one who will take a chance on your product, the one who will go to the mat to get funding for the project, will get utterly turned off by fear-mongering. Interested in raising your new-marketing and content marketing IQ? Join me in Denver this May at the Copyblogger Authority Rainmaker conference.